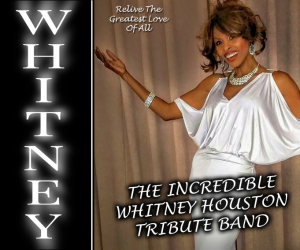 Experience WHITNEY the incredible Whitney Houston Tribute band show! This fantastic performer channels the look, style, grace, and powerful vocals of this legendary artist. It is an exciting ALL LIVE band show celebrating the entire career of Whitney for any occasion, event, or fine venue. We can offer this as a solo act with tracks to fit smaller budgets if you choose as well. Plus she can also offer other tributes to artists like Tina Turner or Beyonce! Whitney Houston is one of pop music’s best-selling music artists of all-time, with an estimated 170–200 million records sold worldwide. She released seven studio albums and two soundtrack albums, all of which have diamond, multi-platinum, platinum or gold certification.